Collectors.com - Search - Max Rambod, Inc.
Jack LordActor Hawaii Five O. Signed Check , entirely in Lord's hand. Signed in red "Jack Lord." In excellent condition. A great example of an authentic signature on a check. Eddie MoneyMusician. Document Signed, 2 pages, quarto, June 2, 1992. 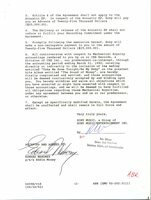 Agreement between Money and Sony Music Corp., regarding music royalties. Signed in black, "Edward Mahoney." staple holes in upper left corner. In excellent condition. Gary PlayerUS Championship Golf Pro. 1 page document, 8" X 11" . Consent form for game show, "Challenge Golf" Document headed "American Broadcasting Company". Reads in part; " ...I have never 1) been given the questions and/or answers in advance of their use on the contest in such program...". Signed in blue ink; "Gary Player". Two punch holes at top. In very good condition. An excellent example. Bob NewhartAmerican stand-up comedian and actor. Noted for his deadpan and slightly stammering delivery, and star of the Bob Newhart Show. Check signed, on Bob Newhart heading, December 27, 1972. For the amount of, "102.85". Signed in blue ink, "Bob Newhart". In excellent condition. Gene WilderUS actor. Signed check on Gene Wilder heading, Entirely in his own hand. Signed "Gene Wilder." Bold signature and in very good condition. JoAnne Worley"Laugh In". Signed check dated December 10, 1969, entirely in Worley's hand for "thirteen....95/100" dollars". Signed "JoAnne Worley". Tear on upper left margin. In very good condition. Brigitte Bardot7-1/2"x9-3/4" color image of the actress relaxing in a wicker chair in a garden. The flowers and green of her dress echo the foliage around her. 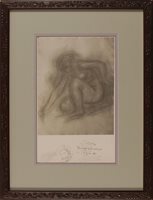 Signed in large letters diagonally across the lower half "Brigitte Bardot." Space Atlas 3Crew of the Atlas 3 Space Shuttle. Large over-sized signed FDC from the day of the launch, November 3, 1994. Envelope measures 5x12" and is decorated with a brightly colored decal commemorating the launch. Signed by the entire crew, "McMonagle", "Brown", "Ochoa", Tanner", "Parazynski" and "Clervoy." Very attractive. Linda RonstadtSinger. Signed check, dated March 7, 1975, Linda Ronstadt heading, written entirely in her own hand. Payable to "The Store", for the amount of "$32.44" . Signed in blue ink, "Linda Ronstadt". In excellent condition. James StewartU.S. Actor known for such films as "It's A Wonderful Life" and "Harvey". DS, 2 pages, 8.5" x 11," 1958. James Stewart has initialed both pages of "Exhibit A" relating to his acting and directing a film entitled "Trail to Christmas "Initialed "J.S" in upper corner of each page. Binder holes on top not affecting typing. In excellent condition. Rudy ValleeAmerican Singer and Bandleader. Partially printed check signed "Rudy Valle" and boldly printed with his name at the top. Payroll check to Harry Stanton for $30.40 on check number 2523 dated December 10, 1945. Before there was Sinatra or Crosby, there was Rudy Vallee. Orville WrightU.S. Aviation Pioneer. The Wright brothers designed and built the first successful motor-powered airplane and on Dec. 17, 1903 Orville became the pilot of man's first flight at Kitty Hawk. Typed letter signed "Orville Wright", 1 page 7 x 10 in., on "Orville Wright, Dayton, Ohio" stationery, 7 October 1922, to Canadian aviator Richard R. Blythe (1894-1941). Wright writes in full: "Your letter enclosing a clipping of your article in the New York Tribune on sky sailing is received. Collection ChecksA collection of 5 Hollywood celebrity signed checks, from classic and current Hollywood actors. This collection contains signed checks by Barbara Eden ("I Dream of Jeanie"), Goldie Hawn, John McGiver, Jack Haley ("The Wizard of Oz"), and Ava Gardner. James WhistlerFamed 19th century British artist. 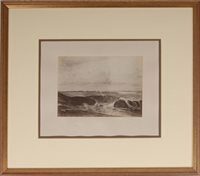 Signed Albumen Photo of Whistler's classic work from 1862, "Blue and Silver: The Blue Wave, Biarritz." Signed on the mount with Whistler's famous "butterfly" signature. "Blue and Silver: The Blue Wave, Biarritz" is a fine example of Whistler's straightforward landscape painting, capturing the moody ocean waves with realism. His philosophy for art was "art for art's sake," and he was averse to moral allusion and sentimentality in his paintings. Isaac SternClassical Musician. One of the best Violinists of our time. 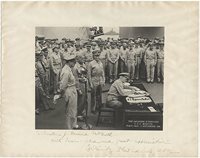 Inscribed Signed photo, b/w, glossy, 5" x 7". Great shot of Stern with his violin. Signed boldly in black on the lower white margin "To Lee Varon-Codially Isaac Stern -1993". In excellent condition. Lucretia GarfieldFirst Lady Wife of the 20th US President. 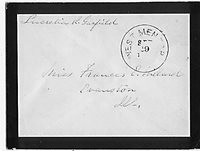 Signed Free Franc Envelope, 4" x 5" , Addressed to Frances E. Willard. Signed "Lucretia R. Garfield". In excellent condition. Jessica WalterActress. Best known for her role in "Arrested Development". Signed check, with Jessica Walter heading. Signed in black "Jessica Walter". In excellent condition. Dennis HopperUS Actor, Writer, Director and Artist. Best known for portraying some of the grittier characters in contemporary American films. 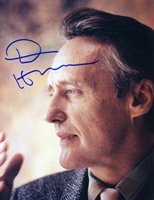 Signed Photo of Dennis Hopper in Profile. color, 8" x 10". Signed,"Dennis Hopper." In excellent condition. Thomas EdisonFamed American inventor. 1 page Document Signed measuring 8" x 13", dated January 1, 1895. An extract from the annual report of the Edison Electric Light Company of Europe, reporting the value of capital stock at two million dollars and outstanding debts totaling less than $22,000. In 1878, Edison formed the Edison Electric Light Company (later known as General Electric or GE) in New York City with several financiers, including J. P. Morgan and the members of the Vanderbilt family.